Does Meagan like the Design? 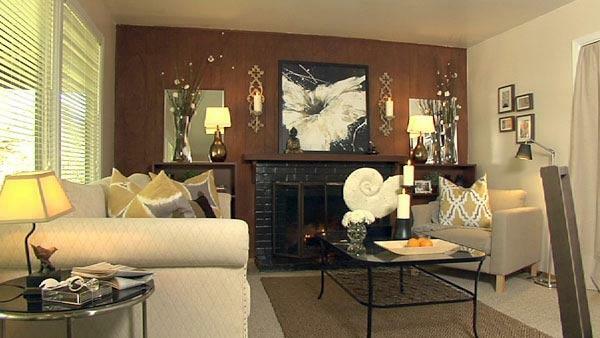 Lisa Quinn takes an outdated living room and transforms it into an elegant living room. It's the perfect space for the newlyweds who love to entertain. This week on HWLQ, we take inspiration from a high-style living room at the Marin Designer's Showcase House and bring a similar look for less to a room in Fairfax. The homeowner this week, Meagan, approached us with a true 'blank canvas'. She and her husband are newlyweds and recently moved into their first real place. As with all new homes, adding a touch of personal style can be difficult without a game plan. The couple also rents, so any changes had to be low-key and tasteful. Our strategy was to play up the view and re-space plan some existing and new furniture pieces to bring a cohesive look. There is no paint this week-- well not the walls at least. The focal wall in the showcase house was a gorgeous slate-clad fireplace on a wood and mirror paneled wall. In our space, we had a similar layout with wood paneling and a brick fireplace. We were able to get permission from the landlord to paint the brick surround a charcoal color to give the impression of stone. We brought in two bookcases from IKEA to flank the fireplace to give a built-in look. Matching brass lamps with black shades cast a warm and romantic glow. Twin vases of DIY flowers add height and drama. Above the fireplace a floral painting adds a graphic kick. Flanking it are two baroque iorn/resin candle sconces from Pottery Barn, which add ambiance. Two wall mirrors above the bookcases finished off the look. As for a seating area, Meagan had already invested in a new white chenille sofa, so that saved a chunk of our budget to splurge on gorgeous accessories! We brought in a generously proportioned club chair in a linen fabric very similar to the seating in the designer room. Super trendy ikat print pillows from West Elm add sophistication. A new glass coffee table takes up less visual room because it is transparent, and is the ideal perch for our FAB accessory finds. Lisa picked up an awesome decorative shell from Zgallerie that adds that "o so chic" designer touch. We removed an unsightly door that threw off our design and replaced it with a tension rod and a linen curtain. In the dining room, an elegant wet bar caters to Meagan's love for entertaining and displays her collection of quirky bar war. The casement is illuminated with multicolored LED lights that can change color and will add instant mood to her next get together. A new round dining table that can expand to seat more guests takes better advantage of the small space and allows for more circulation. A sleek black console in the entry lets guests know from the second they walk in that Meagan has some seriously chic style!